Attorneys are using video to give them an edge in their cases by using it during their depositions, discovery, and in the court room. 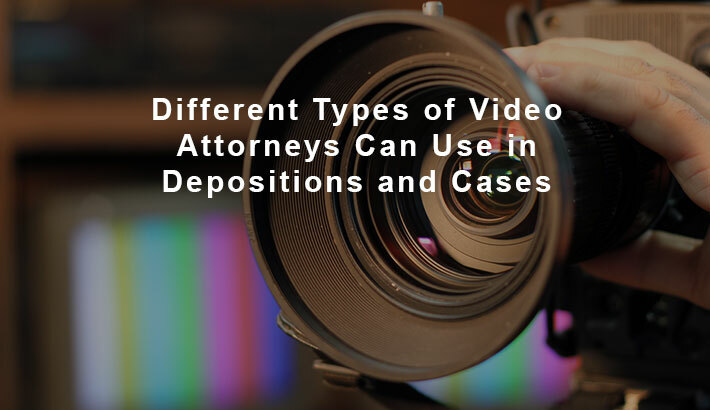 As we speak to legal assistants, paralegals and attorneys every day, we are finding that many are not clear on the different types of video that can be used. In this article, let’s discuss some of the most helpful uses of video for attorneys during the discovery phase and in court. This will be helpful for attorneys looking to gain an edge and for paralegals and legal assistants to understand as they’re scheduling and organizing depositions for attorneys. A video deposition is where a videographer will record a deposition. For video depositions, it is important to use a legal videographer. 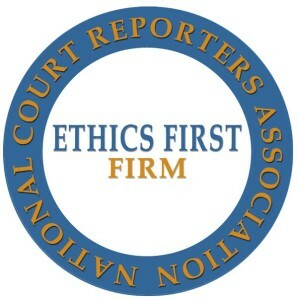 Ask your court reporter or reporting firm to schedule one for you. A full service court reporting firm will often have in house or have close working relationships with videographers. They should already know which videographer(s) are well qualified for the job and will work well with the reporter. 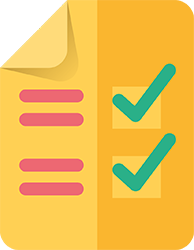 This can help you by making the schedule, billing and production and delivery of the deposition transcript and video process seamless. In the early days of videotaped depositions, attorneys would have to comb through written transcripts and highlight any sections of testimony that would be particularly effective. Then the attorneys (or their staff) would be tasked with a long editing process of finding the video clips and piecing them together to create an effective video, but there was still no way to add the transcript to the screen. Today’s technology has come a long way since then, and attorneys can now receive a video deposition synced with the text of the transcript from court reporting firms who have the technology. This allows attorneys to quickly search and edit video clips for a trial presentation, reference the text for clarification of what the deponent stated. When travel isn’t the best option, videoconferencing is extremely useful for depositions. Through the use videoconferencing software, equipment, cameras, and high definition screens, you can have your deposition with anyone, almost anywhere. Instead of trying to find a videoconferencing solution on your own, ask your reporter or reporting firm if they can provide it for you. Some firms will have state-of-the-art technology and will host your deposition in a videoconference room. Your court reporter may help you schedule, organize and implement your long distance videoconference. They may even help you find another videoconferencing site close by your other participants. Here at Casamo & Associates (as well as some other firms), we are affiliated with comprehensive videoconferencing networks, allowing us to easily take care of the details for you. Please note that if you need to use videoconferencing during a deposition, let your reporting firm know in advance. Having a good videoconference takes more than just clicking a button to connect. Here at Casamo, we do a test call to make sure the two systems (our system and the system at the other connecting site) will connect and work properly. We normally like to do that a day in advance. It helps us create a better experience for you if we have some advanced notice. If you use another firm, this would probably apply. Mobile videoconference is where the videoconference is brought to you! Have a laptop? Participate from your office! If not, reporting firms who provide mobile videoconferencing can bring a TV, laptop, microphone, and webcam to set up in your own conference room! REMINDER: If you tell your reporting firm you’ll need video for your upcoming deposition, please don’t be surprised if they ask if you’re wanting a video or videoconferenced deposition. There is a difference. As discussed above, a video deposition is where a videographer is in the deposition room recording the deposition. A videoconferenced deposition is where videconferencing technology (camera, screen, etc.) is used to include those in the deposition are not able to physically be present. If a picture paints a thousand words, imagine what a video can do for your client. A day in the life video brings your client’s story to life and personalizes the injury as words never can. The video will show your client performing activities that have been affected by his or her injury. The judge or jury can see the pain your client experiences moving about in their home, getting in and out of their car and in the simple functioning of daily life. Video Depositions – You can use them to reference something that was stated and even impeach a witness if their story is contradictory while on the stand. When you’re using video in court, it may be helpful to have someone there as tech support to make sure everything goes smoothly with the video and other presentation material you may have. If you’ve used a videographer from a court reporting firm, they may also be able to provide trial presentation support. Are you, as an attorney, using any of the 7 different types of video for depositions and case? How are you using it? What type of video are you using? If you have any questions or would like to speak with us further about using video, please call us at (703) 837-0076. Have you downloaded our Deposition Resource Guide for Attorneys & Paralegals? The guide discusses some of the most important deposition resources and how to best use them for your benefit (including more about video and videoconferencing). Whether you’ve just entered the legal field or have been conducting depositions for years, there is something in this guide for you. If you haven’t yet, get your guide.